Everywhere you look there are more and more projects that include fabric on cards and scrapbook pages. Let's face it, fabric on cards and scrapbook pages is HOT! So today I have a technique that I'd love for you to try...not only is it easy, but it's a wonderful way to use up those bits and pieces of fabric scraps that you may have laying around the house. I called this TLC Fabric Flowers, (I had to call it something), but don't limit yourself to just flowers with this technique. 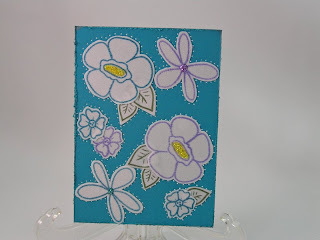 I saw THIS POST about printing digital paper directly onto fabric and thought that many of the same step would work wonderfully for making fabric flowers (or any embellishments) to be used on cards or layouts. For those of you who don't have any fabric scraps lying around, you can go to any fabric store and even Wal-Mart carries little bits of cotton fabric in a wide variety of patterns and colors. Another great resource for fabric pieces is Good Will, Salvation Army or any thrift store - just pick up a used shirt or skirt, take it home and start cutting. One of my favorite sources of fabric is the wallpaper store...yep, that's right. Wallpaper stores throw out old-outdated sample books and are happy to have you come and take one or two off their hands. Most of these sample books contain coordinating fabric samples in the back. These are great to use because they are already bound to a paper backing and are basically "ready to use" and best of all, they are FREE! One problem with fabrics and embellishments is that they tend to fray and are often a little floppy or flimsy for use on a project. I have a couple of solutions for you, so let's get started. One problem with die cutting fabric is that it has a tendency to fray and bend, rather than achieving a nice, crisp cut, but we can fix that with a little freezer paper. Applying a paper backing to fabric helps the die to cleanly cut. 1) Heat your iron with no steam. If you are using cotton fabric, you can use a higher heat setting than you can if you are using something like polyester (which can "melt" at higher temps), so use your judgement here. 2) Cut a piece of fabric size appropriate for your diecut. 3) Trim a piece of freezer paper just a tad smaller than your fabric. 4) Lay the waxy side of the freezer paper face up on your ironing surface. 5) Lay the wrong side of your fabric onto the freezer paper (you want your "pretty side" facing you as you iron) and press the fabric allowing the heat of the iron to melt the waxy coating from the freezer paper into the fibers of your fabric. 6) You're now ready to use your die to form your fabric piece. I tried, but could not get any of my punches to punch through the fabric/freezer paper. My dies works FANTASTICALLY, however. BUT YOU DON'T HAVE TO USE A DIE for this technique either if you don't have them. As shown in my sample below, you can follow this same procedure and create a fabric embellishment or focal point from ANY stamped image that you have. 1) Choose a light, solid color fabric. 3) Using ink, stamp your image onto the fabric. Keep in mind that some fabrics will bleed (or wick out) the ink. I have learned that a good solid application of stay starch prior to applying to the freezer paper, cuts down the wicking a good deal. 4) Now just use your scissors to cut around the image and apply to your project. One product that I'd also like to mention is called Designer Tac Double Tac Tape. It's made by a company called La D'ore and comes in a variety of sizes. The tape I used is 2" wide and I have used it on a variety of techniques, one being the white fabric stamped flowers in one of my samples. It's very similar to Tacky Tape, with the exception that it is 2" and my roll came with 15 yards. Let your imagination run wild with a variety of patterns and colors. Add crystals, stickles, buttons, hand-stitching to your elements to really create a great look. To view my sample card, CLICK HERE. To view the gallery of creations using this technique, CLICK HERE. Remember to use the keyword TLC230 when you upload your projects to the gallery. AND ON ONE LAST NOTE: I will be away from the TLC challenges for the next two weeks. I have a familiar face filling in for me while I'm gone, so I'll see you all on August 10th. thanks Lynn and have a great vacation!!! What a fun challenge! The samples are beautiful and I can't wait to give this a try. Great tutorial, looking forward to digging through my fabric scrap drawer! ohh o hiss I don't have any spare fabric...maybe I should cut up those tattered jeans! Sounds fun Lynn! Can't wait to try it! Oh, fun! I'm all over this challenge. One question -- do you remove the freezer paper after you die cut? I did not remove my freezer paper. It's the paper backing that keeps the fabric from just bending and fraying in the die. I can do this !! Thank you for a great idea! I have fabric and dies, but no freezer paper. Is there anything else I can use? great challenge..... I want to play later! Sounds like good fun. No freezer paper like you have available here, but I think I have some good stiff interfacing, so I'll experiment and hope that it works in the Wizard. Otherwise I'll be resorting to stamping. Which has always bled for me in the past - but I do have spray starch. Thanks for this fun on the menu today, Lynn. If you have spray adhesive, you could try that as a way to attach text weight paper to your fabric. Interfacing may work. I'm anxious to see your results. Good thought - I certainly do have spray adhesive. Lots of options to try, then. Thanks for that suggestion, Lynn. Here is my Transparent Butterfly Card. I only call it transparent since you can see the flourish behind the butterflies. I have a roll of Heat & Bond adhesive that I use all the time. YOu can buy this at Joanns. How great is our Lynn?! I LOOOOVe this technique! Such a great challenge - thanks Lynn! In the end I seem to have ended up with a Bowl of Peonies. And a lot of fabric still on the floor - have to tidy it away now, maybe keep a few scraps out :D.
Here is my entry for another fun challenge. Thanks Lynn, this was so much fun. I loved playing with the fabrics this morning. I used a square nestie to cut my fabric glued on paper, ( no freezer paper). Worked out pretty good. What a fun technique but alas no wax paper and no fabric. :( Can't wait to see all of the awesome creations!!! No - not wax paper, FREEZER paper...there is a difference. If you have spray adhesive, you can use that and attached your fabric (which you get from the bag of clothes you were going to donate to charity...lol) to a piece of typing paper. What a great challenge Lynn! I always look forward to Monday Mornings...the hubby is off to work and I can look up the TLC. As I was looking this morning...I realized it said 7/20...yikes...where has the month gone. I've been soooo busy that I haven't been able to participate. Today I have all day to do nothing but play...and I can't find freezer paper. Went to walmart...and grocery store...and no freezer paper. I'm thinking of going to the meat counter and asking for a few sheets. I'll get back to you on this one. Wish me luck. I love this technique. My sizzix bigz dies are perfect for this. I never thought to use freezer paper. I used something from Joann's called Craft Fuse. Off to try and will post my creation later. Thanks for a great technique! This is my first time uploading to a thread, hope it worked! If it did, this is my attempt. I forgot all about this fabric I bought when I first purchased my big shot, thanks for reminding me and for sharing this great technique! OHHHH! I sold all my old fabrics in our garage sale! I will have to see what I can dig up! Last time we did a technique that involved the ironing board, I ended up doing 2 hours of ironing. That was the last time that my board was out, so looks like this afternoon I will be at the ironing again! Could you post a technique about every two months or so that involves ironing so that I will keep up? Thanks! This look like a fun technique!! Oooh! Great challenge, Lynn! I'd love to play today, but probably not until the weekend! Thanks for incorporating fabric into your challenge! And I hope you'll be doing something fun during the next 2 weeks! thank you for todays wonderful challenge ! !